Jan Marcos Riveras is one of the easiest-going, accessible and friendliest pro-kitesurfers I have met out there. We first met him during his winter holidays in Cabarete with his family and had the pleasure to meet him again during the GKA Kitesurf World Tour stop in Dakhla. Hey Jan Marcos! Tell us a bit about yourself, why did you get into kitesurfing in the first place and what made you move from on kite paradise, Cabarete, to another one, to Tarifa? 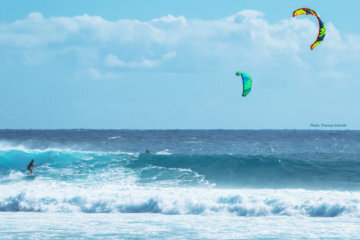 So if you compare both kite scenes, Cabarete and Tarifa, what do you like particularly about each of those? What does a typical day in your life look like? Could you take us through one day? What inspires you to keep going, to always keep on practicing and pushing your boundaries? What motivates you? Are there any habits that make you so successful, is there anything that you follow through that makes you successful or so determined? Jan Marcos moved from his beloved home spot Cabarete to Tarifa, to push his riding and skills even further. While competing, practicing and staying fit is one of his main priorities – his family always comes first. Not only has he been Wave World Champion in 2009, but he also won the “Ironman of water sports” – the Master of the Ocean, in 2007 and is currently competing among the best in the GKA Kitesurf World Tour. Coming from a really nice place, which Cabarete is, it was a really hard decision. But at the beginning I had to change my life, I had already pretty clear in mind what I wanted to do and I knew already what I wanted to be in this life. So I decided to change because in Cabarete you don’t have that big aspire to be better. You know we have really good wind conditions, the weather is amazing but if you want to get bigger you have to go a little bit outside of it. Jan Marcos: Cabarete is my favorite spot and it will always be. The nice thing about Tarifa is it that you have some things that I miss from home and I think it’s the Caribbean of Europe, you know? Tarifa is a special place, it has wind almost 365 days a year and we have both directions of wind. 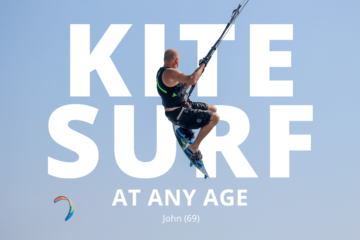 We can go surf, we can go kite, we have everything! Except that the weather in winter is a little bit cold compared to my hometown. But that’s what I do: in winter I skip Tarifa and I go back to the Dominican. Jan Marcos: A typical day for me is waking up and the first thing I do is just take a big glass of water, as soon as I put my feet on the floor. After that, the day starts with my little daughter. Making breakfast for the family, we always have breakfast together. After that work and of course afterwards I’ll directly go for a kite session. I always look for the best spot because in Tarifa we have a lot of different areas to go kitesurfing. Either way, before work I go swimming or boxing at night, dinner and there is so many other things I do during the day. 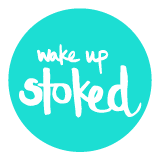 But basically it is waking up, family, breakfast, work, swim, then kite session and at night I go for a training session of boxing. 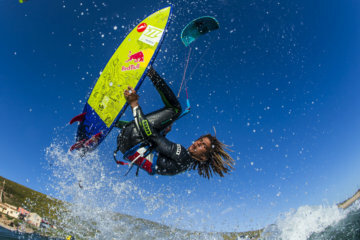 Jan Marcos: I always say kitesurfing is a way of life, a way of living. You know it’s a sport that allows you to learn and to see so many places, so many different cultures and I think it’s a sport you can fly anywhere in the world and you’ll always be connected with new people. It allows you to learn so many things and thanks to that I’m here (in Dakhla at the world tour, Ed. note). So kitesurfing to me is a way of living. Jan Marcos: The thing is: I like to be natural, I like to share it with people, I love seeing everybody happy. Especially when I’m in the water, I always keep in mind that it’s really important that the audience outside or the people who are just watching are so important – for us, for the sport. So I think sharing with them is really one of my biggest goals because that motivates me to continue doing what I’m doing. 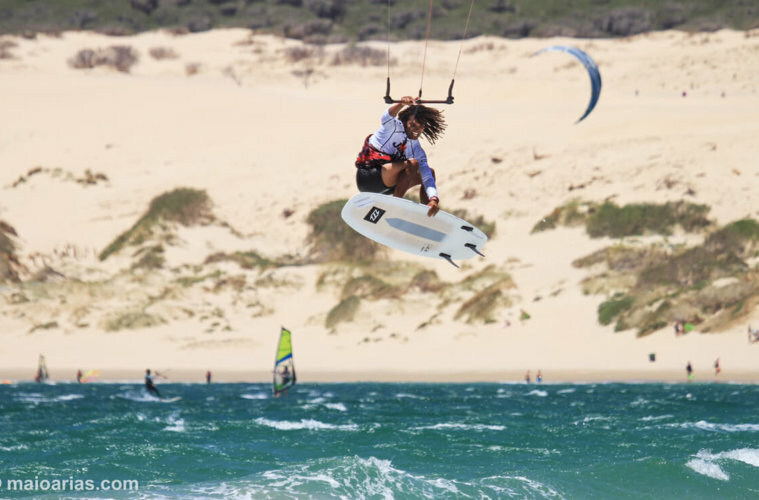 > Do you want more inspiration on strapless freestyle kitesurfing? > Do you want to go to Dakhla yourself? 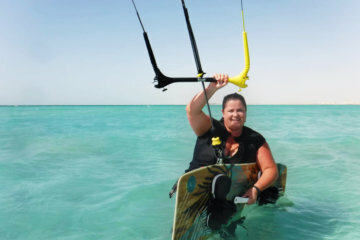 Check out the detailed Spot Guide on Dakhla.